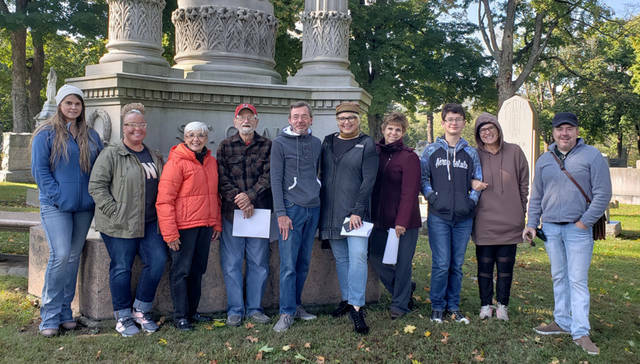 Some of the Darke County Center for the Arts Ghost Walk guides and actors take time for a photo in Greenville Union Cemetery as they prepare for the upcoming event. The annual Ghost Walk in downtown Greenville will begin at 7:30 p.m. Oct. 26, Oct. 27 and Oct. 28. The new Ghost Walk in Greenville Union Cemetery will be at 4:30 p.m. Oct. 28 and again on Halloween night, 6 p.m. Oct. 31. GREENVILLE – Darke County Center for the Arts will continue a long-standing Halloween-season tradition when it hosts its annual Ghost Walk in downtown Greenville beginning at 7:30 p.m. on Oct. 26, Oct. 27 and Oct. 28. The organization also will host a new Ghost Walk in Greenville Union Cemetery at 4:30 p.m. Oct. 28 and again on Halloween night, 6 p.m. Oct. 31. Tour guides who will lead the walks are Michael Bitner, Marilyn Delk, Tim Nealeigh and Keith Rawlins. Actors who will spin additional spooky tales are Gail Bankson, John and Karen Burkett, Nick Colby, Tanna Cornett, Larry Delk, Kianna Dishman, Katheleen Nealeigh, Wyatt Reed, Jan Roestamadji, Jamie Stocksdale and Heather Voisard. Many of the tales to be spun are based on stories collected by Arcanum-area resident Rita Arnold, which tell of local ghostly encounters; some newly discovered spooky stories will be included in both walks. DCCA officials remind Ghost Walk participants that some tour sites include uneven terrain and may be dimly lighted. As in years past, the Downtown Ghost Walk will be held regardless of weather conditions; if seriously inclement weather occurs, the stories will be told at Memorial Hall. However, no appropriate alternative site is available at the cemetery; therefore, bad weather would force a cancellation of the Cemetery Walk. Greenville Masonic Lodge No. 143 Craft Club will serve refreshments at St. Clair Memorial Hall before and after the Downtown Ghost Walk. Tickets for the Downtown Ghost Walk and the Cemetery Ghost Walk each cost $10; however, tickets for the two walks are not interchangeable. While advance tickets for the Cemetery Walk are only available online at www.darkecountyarts.org and by contacting DCCA at 937-547-0908 or dcca@darkecountyarts.org as well as at Greenville Public Library, tickets for the Downtown Walk also can be purchased at Ann’s Gifts, Readmore’s Hallmark and Darke County Visitors Bureau Welcome Center in downtown Greenville. Tickets for the Downtown Walk will be sold at the door at St. Clair Memorial Hall; entry to the Cemetery Ghost Walk will be at the North Main Street Greenville Union Cemetery entrance where tickets may be purchased immediately prior to the event.